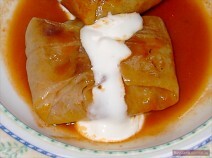 Golubtsi (Russian: голубцы) are stuffed cabbage leaves. 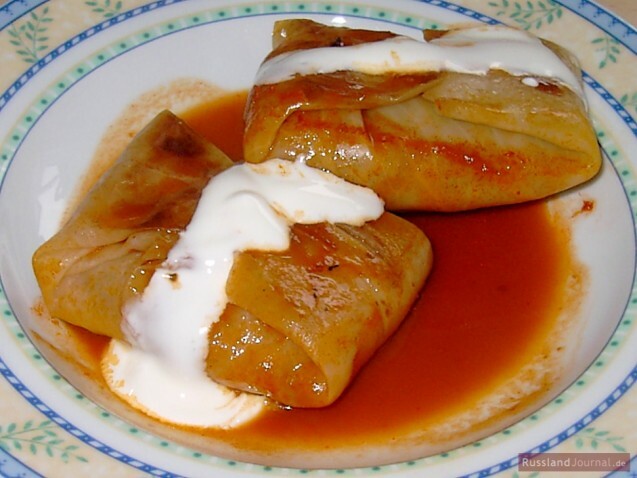 In Russian cuisine, cabbage rolls are made with white cabbage and stuffed with a mixture of minced meat and rice. Traditionally beef and/or pork is used. Golubtsi made with chicken are tender and mild in flavor. One can also add tomatoes and carrots. Vegetarians can use vegetables or mushrooms as meat substitutes. The name “Golubtsi” is supposed to be derived from the Russian word “голубь” = “dove”, as the form of the cabbage roll reminds of a sitting pigeon. For vegetarian golubtsi substitute beef with 500 g (=1.1 lb) chopped and sautéed mushrooms. Wash cabbage and remove outer leaves. 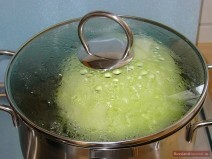 Place cabbage head in a large pan with boiling water, cover and simmer for about 15 minutes. Drain and cool cabbage head with cold water. 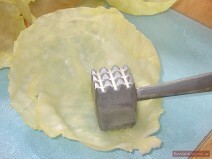 Carefully pull off large leaves without breaking them and beat flat with flat side of meat mallet. Cook rice in salted water until half-ready. Finely chop onions and sauté in oil or butter until translucent. Peel and grate carrots. Remove tomato skins and seeds. Finely chop tomatoes. Combine everything in a bowl. 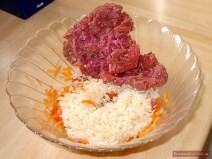 Add rice and ground beef, season to taste with salt and pepper and mix well. 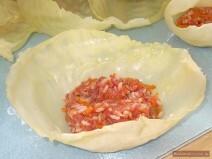 Put 1 tbsp of the filling on the inner side of each cabbage leaf. Carefully fold the leaves like envelops and fasten with a thread. 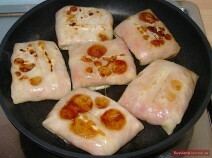 Heat oil or butter in a pan and fry golubtsi on both sides until golden brown. 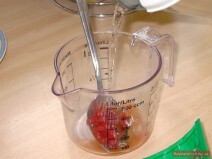 Bring vegetable stock to boil, add tomato paste and bay leaves. Place golubtsi in the pan and simmer for about an hour. 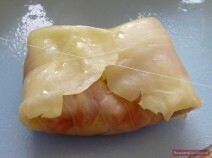 It is also possible to slow-cook golubtsi in a preheated 145 C oven. 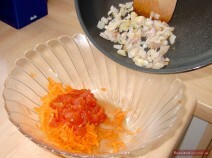 Remove threads and serve golubtsi with tomato sauce and sour cream.